What is the average cost of air conditioning? Selecting a new air conditioner for your home is an important decision. With a wide range of high quality, energy efficient air conditioners on the market today, it’s important to select the right unit for your home. There are several factors that go into figuring the cost of central air conditioning. 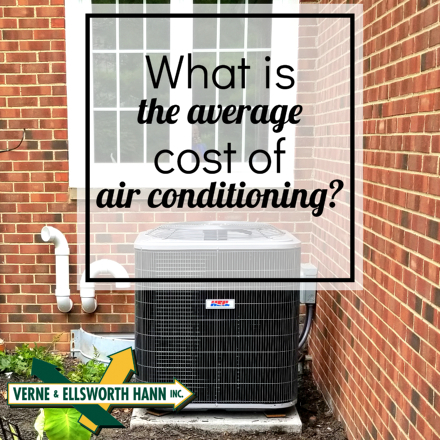 The size of your home, the efficiency of the unit and the type of system are just a few, but the average cost of a traditional air conditioning system is around $3,000. Verne & Ellsworth Hann, located in Cleveland Heights, has been successfully installing air conditioning in Northeast Ohio for over 63 years. With 5 generations of family experience and the ONLY Hann family owned HVAC company in Cleveland, Verne & Ellsworth Hann is a company you can trust. Let experts and co-owners, Chris and Bill Hann, guide you through the selection and installation process with ease. Servicing Cleveland Heights, Shaker Heights, University Heights, Beachwood, Lakewood, Lyndhurst and much of Northesat Ohio, call Verne & Ellsworth Hann today at 216-932-9755.